alaTest has collected and analyzed 872 reviews of Lenovo Yoga Tab 3 Pro 10-inch (2016). The average rating for this product is 4.1/5, compared to an average rating of 4.5/5 for other products in the same category for all reviews. Reviewers really like the size and screen. The battery and usability are also appreciated, but the touch screen and portability get critical views. We analyzed user and expert ratings, product age and more factors. Compared to other products in the same category the Lenovo Yoga Tab 3 Pro 10-inch (2016) is awarded an overall alaScore™ of 93/100 = Excellent quality. The Lenovo Yoga Tab 3 Pro features a built-in rotatable pico projector, great speakers, long battery life and a built-in kickstand. The Lenovo Yoga Tab 3 Pro has a built-in pico projector and an ergonomic design with a kickstand. Performance and gaming is fast. Screen is sharp and speakers are loud. Battery life is long. It's a bit heavy and its cylindrical spine makes it awkward to hold in landscape orientation. The Lenovo Yoga Tab 3 Pro is the best Android tablet for watching video. Either alone or, thanks to its built-in projector, with a large group of friends. Let's face it, tablet-makers. You're not going to beat the iPad. 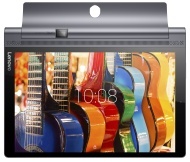 Lenovo is sensibly not even trying, instead coming up with something completely different in the Lenovo Yoga Tab 3 Pro. A genuinely different tablet with great media skills and decent stamina.